Christmas is all around me....(and I can't wait to watch Love Actually). We've put up our tree. This year, the kids were with me in Stanley when they were unpacking them, and they had great fun choosing one. I felt bad that Joey missed out on this part, though. We'll have to work on our new Christmas tree tradition in this new house. It's still nothing like wheeling the golf cart into the market to choose one. That was a real excursion. Still, we have some good old traditions that have followed us here. Everyone picks an ornament to put on the tree first. We took out our hands-on Nativity set. We're going to have to keep a close eye on Mary and the Angel this year. Don't want them to go missing again. Perhaps they're just modern women - on the go. Jojo and Cally played with the Nativity while we finished the tree. Number three is very destructive - so we have to keep everyone's eyes on her. All. The. Time. We also took out the Nativity finger puppets from a dear friend Diane and her family. 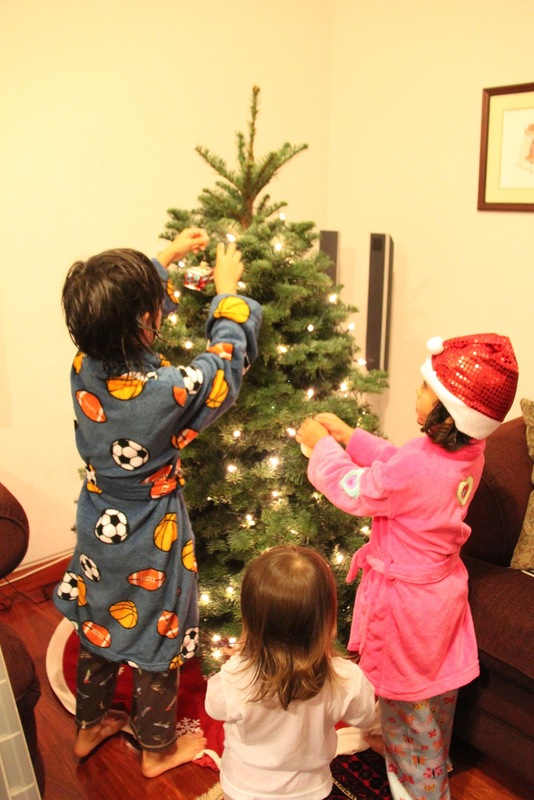 We made small adjustments with ornaments, but mostly the kids did everything. We had to say a few things about the ornaments whose special role is to fill the back of the tree. Hey, it may not seem like fun, but the back of the tree needs to be decorated. 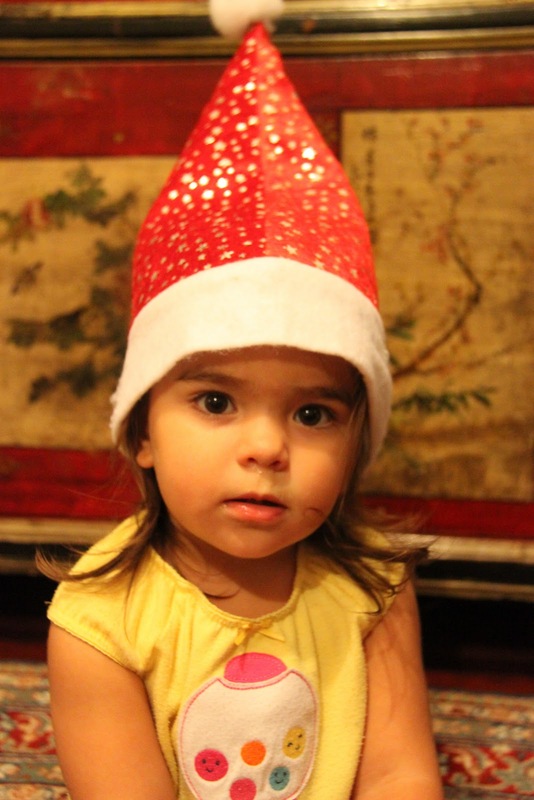 Each of the kids got out their Santa hats. Cally's has silver stars. 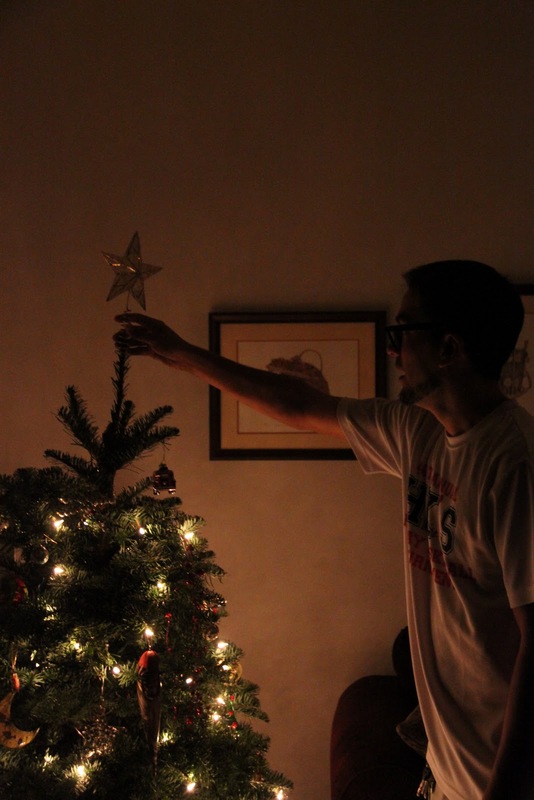 And, finally, Joey put on the star. I love this season, with all its traditions, new and old. My family will be all together this year in Malaysia. And, we'll even get an extra week with Naem, Jared and Milo starting Sunday. LOVE YOU JUST A FEW MORE DAYS!!!!!!!!!!!!!!!!!!!!!!!!!!!!!!!!!!!!!!!!!!!!!!!!!!!!!!!!!!!!!!!!!!!!!!!!!!!!!!!!!!!!!!!!! I just love your blog Norbayah & I'm thinking of you as you all gather together....may time s l o w down so you can savor each Christmas moment! I can't believe you still have the finger puppets! Aw...my heart is touched deeply to see them on precious fingers. Let the Story be told!! Love you all. modern women~ on the go.